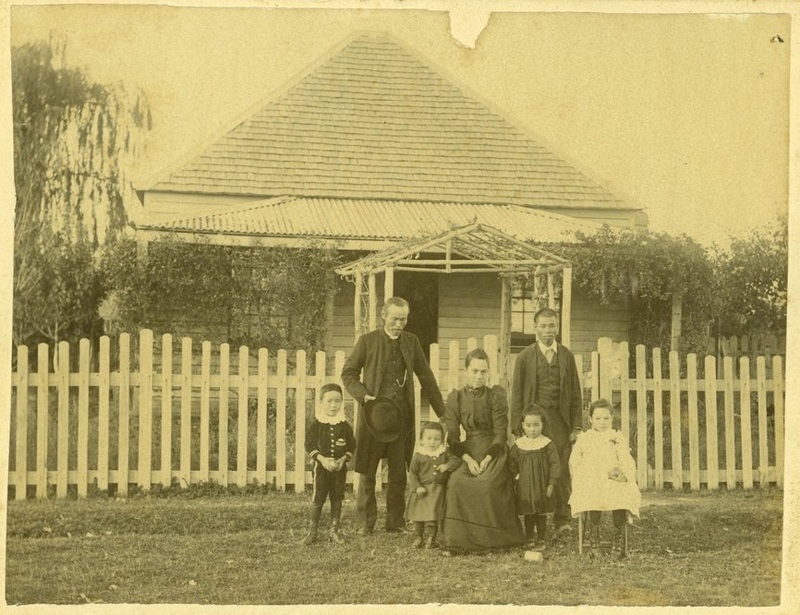 Family grouped in front of picket fence, woman seated with two little girls, and possibly a little boy in short petticoats, beside her, two men standing on either side of her chair, a little boy standing beside man on left. Weatherboard house in background, tiled roof, and pergola, vines growing along roof line of porch. What isn’t noted (except in the subject keywords) is that this family looks to be Chinese. In fact, I’d hazard a guess that the woman was of mixed heritage. The photograph comes from the John Etkins collection, a private collection of around 2000 portrait photographs donated to the library in 2004. Inscribed in pencil on the back of the photograph is ‘[…] Wang in (?) Govt. Office / Inverell’. It is dated somewhere between 1880 and 1910. Not much of a clue as to the family’s identity, but perhaps one day I’ll stumble upon something that tells me who they are. Description: 1 photographic print on cabinet card : albumen silver ; 10.7 x 16.6 cm. ; 1 photographic print : albumen silver ; 9.7 x 13.9 cm. Identifier(s): State Library of Victoria, Accession no(s) H2005.34/103.